The sound of a true sports car exhaust is something that should stir the senses. A carefully designed and constructed exhaust system will achieve this – something we have created in our Signature range of performance sports exhaust systems. 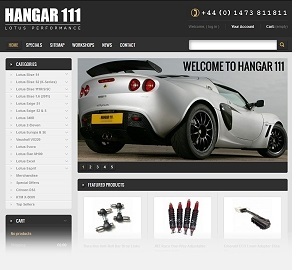 At Hangar 111 our standards are very high, so in 2003 we decided to design and build our own range of exhaust systems. Each system is specifically designed for each model of the Elise, Exige, Evora and 2-Eleven and constructed exclusively for Hangar 111 by an established OEM manufacturer who also implement their own exacting standards. This means you get the finest possible construction, ease of fit and durability in each system we sell. It also means that you’ll have an exhaust that looks and sounds great for years to come. All Signature Series exhausts are designed, developed and constructed here in the UK. Each system is constructed from several high-grades of stainless steel and features a brushed-finish exterior with polished tail pipes. We incorporate a patented UK-manufactured acoustic media in our silencer packing for durability. Assembly is achieved with a mixture of MIG & TIG welding to achieve both a durable internal construction and attractive external finishes. All systems feature our Signature brand etched into the silencer so you know when you have a genuine exhaust system from Hangar 111. Using carefully developed silencers (not off-the-shelf component items), we have managed to achieve a beautiful sports-car exhaust note, while avoiding reverberation into the cabin and noise levels that will greatly reduce the likelihood of being black-flagged on the track. For accuracy and ease of installation we have created jigs to OEM production specification. This is also true for our range of motorsport catalytic convertors, decat pipes and manifolds. Designed with CAD, tested and flowed on a Superflow flow bench and fitted to road, track and race cars for complete testing, we have created a range of exhaust systems that that we are very pleased to offer our customers. 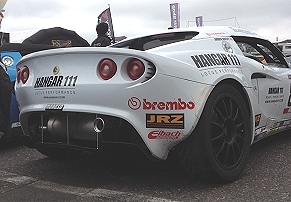 If you are looking for an exhaust system for your Lotus that performs, sounds great and allows you to get on the track, look no further than our Signature range. Sports exhaust systems and catalysts are available for all models and variants of Elise S1, Exige S1, Elise S2 & 111S, Elise 111R & Elise S, Exige S2 & Exige S, 2-Eleven. Look out for our video clips in the online store to see and hear our Signature exhaust ranges in action. View our full range of Lotus sports exhausts in our online store. To make a booking for installation or for more information please contact us.